This is a 5/8″” wide. very high-quality velvet ribbon in Black. It is soft and supple and is very easy to work with. 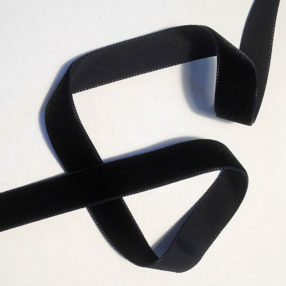 You can buy velvet ribbon elsewhere but you won’t get better quality! Imported from France. Great for bodice trimming and Victorian “necklaces”. Also comes in 7/8″, 1 1/2″, & 2″ wide.